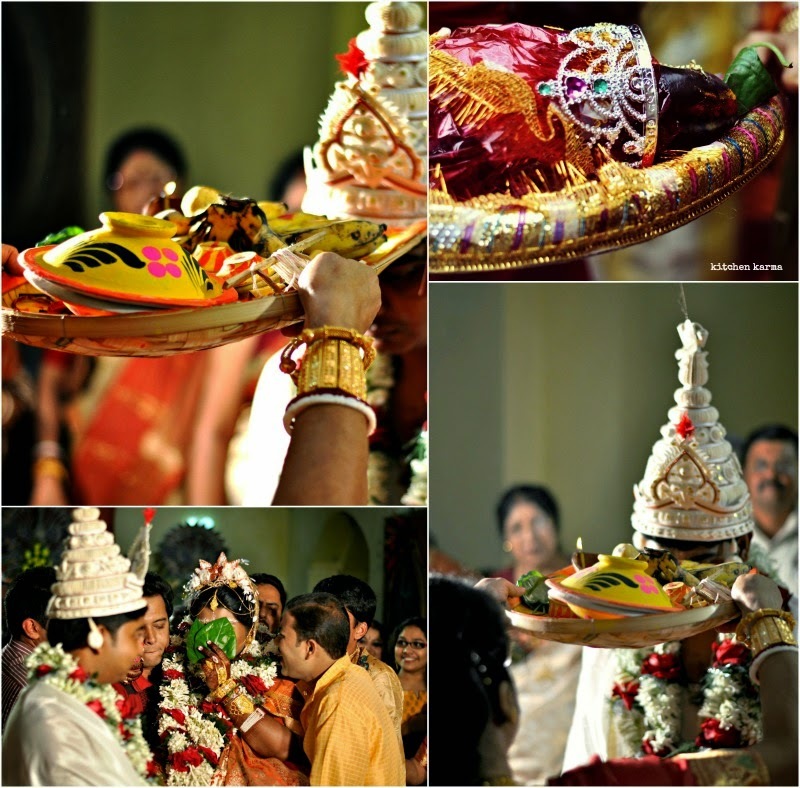 Glimpses of the Hindu Bengali wedding that I recently attended in Kolkata, India. I must confess I did not take many photos. Was too jet lagged and was too busy chatting and eating. But here are a few that I did manage to click. Sharing these four in particular because they show the heavy use of flowers and fruits in the Hindu wedding. To begin with the bride and the groom are made to wear heavy flower garlands. They are heavy and itchy, can tell you from experience. The bride's hair is usually done up in a complicated formal bun and has several garlands of flowers and then covered with a veil. A complete waste of all that hard work, if you ask me, not to mention the severe discomfort the poor bride faces. Then they go over the top and make the bride wear flower ornaments. But that torture is reserved for another ceremony, a few days later. Let's talk about more interesting things, like the fish. The photo at the top right hand corner is that of a fish dressed up. If everyone can dress up for the wedding, why not the poor fish? Fishes are a really important part of the ceremony and a whole fish dressed up as a bride is sent by both the groom's and bride's families to each other. It is considered scared. Then that fish is pieced up and eaten and the bigger & sweeter the fish the more praises the family who sent it gets! And no bit of that fish is wasted, the head and the bones are used to cook a mixed veggie dish called the chachhra, the pieces are both eaten fried mach bhaja and in a mustard curry. Then there are two photos of the ceremonial greeting with which the bride's mother greets the groom. The plate kind of thing she is holding is kulo, a bamboo tray of sorts traditionally used to sort out rice grain and remove the impurities from rice, before it is cooked. It has various items, the foodie bits are seven bananas, seven betel nuts. There is some significance to the odd numbers. Then the bottom photo on the left is that of the bride and the groom meeting for the first time during the ceremony. By then it is the evening of the second day that the ceremonies have been going on. The bride is carried by her brothers/male cousins and her face is covered by a pair of betel leaves. She uncovers her face when directed by the priest. The bride and the groom is then asked to exchange looks. This is called subho disti, the scared look. The wedding is a mix of religious and folklores or what we called in Bengali lokachar. Lokachar are basically community practices having their roots in agrarian societies. I guess for urban Bengalis these customs are a way of being in touch with their long lost agrarian roots. Another interesting bit of the wedding is the significant role played by the barber. There is a separation of roles while the priest supervises all the religious rituals & recites the Sanskrit slokas/chants, the barber presides over all the folk ceremonies. In case you are wondering when will the foodie photos of the wedding come, for there are feasts with unlimited food for several days. I am sad to say I did not take any photos of those. Come on I saw Kolkata biriyani after ages, ah it's smell, the goat meat pieces looking succulent and tender and the white and saffron coloured long grained rice tempting me. I know not very food blogger of me, but what to say I am a glutton first.